Wigan Warriors prop Tony Clubb says the surgeon who removed his kidney eased his fears of retirement after career-threatening surgery. The 30-year-old underwent the procedure on 5 May and, 58 days later, he returned to score a try in the 28-12 win against Widnes on Sunday. "The doctor was good with me. He put me at ease because in my head I was thinking of retirement," said Clubb. "Broken arms heal but with my injury I didn't know what was going to happen." PODCAST: Who will be rugby league's 2017 Man of Steel? A fault in the tube connecting to Clubb's kidney had effectively killed the organ, leaving no choice but to have it removed, and the surgeon's option to perform a keyhole operation was a success. "The surgeon reassured me that I could be back training in eight weeks," he told BBC Radio Manchester. "Doing a keyhole rather than full open surgery shortened the recovery time." 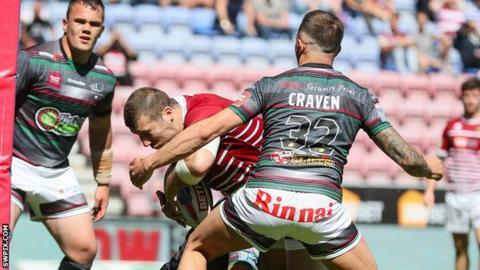 After a full month of rest and five weeks of running to keep fit, Clubb returned to play 55 minutes and help end Wigan's eight-match winless run with a try. "All of that four or five weeks of running felt good but it never compares to a full game," he said. "Those 55 minutes felt like an hour and 55 minutes, but I enjoyed being back out there. It was tough but Waney said to me 'whenever you feel tired, just stick your hand up and I'll bring you off.'" On scoring a try for the first time this season, he added: "I never thought I'd get one but I found the line thanks to Sam Powell. My first one of the year as well, which is nice." Wigan next face Catalans Dragons in France on Saturday and Clubb feels ready for another run out, adding: "I'm ready to get straight back in. "I've got no pain and it's all been good. The surgeon said I don't need to see him anymore and I'm ready to crack on."